Ten years after the FDA approval of mifepristone for medication abortions, it's a good moment to think about what its availability has changed — and what it hasn't. The earlier in an unintended pregnancy an abortion occurs, the safer and less costly it is. Medication abortion is only appropriate for unintended and untenable pregnancies up to nine weeks. Availability of medication abortion has meant that an increasing share of abortions are early, and an increasing share of early abortions are done before six weeks or before nine weeks. "Instead, almost a decade later, we find that women in areas that already had access to abortion now have the choice between a medication or a surgical abortion. 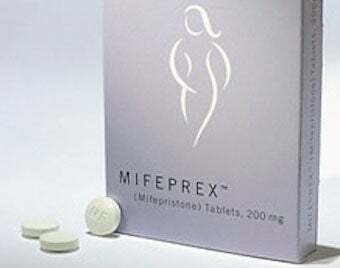 But for most women who were not easily able to access an abortion provider before mifepristone became available, services remain difficult to obtain. Women seeking the pill can go to one of 16 clinics, have an ultrasound, be examined by a nurse, then talk to a doctor by a secure Internet connection. The doctor has the woman's medical records and, if no complications are detected, can remotely open a container to provide the pill. Almost 2,000 women have benefited from the program. Another advantage of the program: it decentralizes operations, making it that much hard for anti-abortion activists to try to intimidate the patient or the doctor. But medical abortion isn't for everyone, as the CEO of Reproductive Health Technologies Project told USA Today. While it's helped beef up offerings at Planned Parenthoods that used to only be able to offer family planning, she said, "abortion is a really individual experience." Women who favor an abortion via medication prefer "being able to experience an abortion in the comfort of their own home and surroundings," she says. But "if you're a mom with two young kids at home and a boyfriend who's not that helpful," you might prefer a surgical abortion. "Increasingly, though," Moore says, "if you do go to an abortion provider, you're going to have options when you get there, and that's always a good thing."